Your donations to Cantores are tax-deductable, as Cantores in Ecclesia, Ltd. is a 501(c)3 non-profit corporation. Our Federal Tax I.D. number is #41-2042868. On behalf of Blake Applegate and the Board of Directors, Cantores in Ecclesia thanks you for your interest and support. A liturgical choir dedicated to preserving and promoting Gregorian Chant and Sacred polyphony, we primarily rely on individual gifts and offerings to sustain our challenging and ambitious year-round program of sacred music. 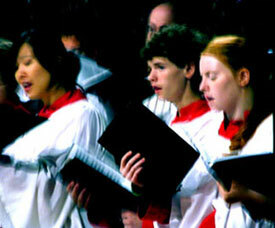 One highlight for many Portlanders is the choir's annual William Byrd Festival. Founded in 1997 by Dean Applegate, it has achieved an impressive international recognition, attracted musicologists and artists from throughout the United States and abroad. Although an expensive undertaking, freewill offerings at lectures, Evensong, recitals and Masses, and affordable ticket prices for the opening and closing concerts, help ensure that Byrd's magnificent music might be accessible to an ever widening audience. This commitment to excellence and affordability would not be possible, nor could any of the work the choir undertakes throughout the year continue, without countless volunteer hours and the continued generosity of our benefactors and friends. Help us to secure the future of our mission by supporting Cantores in Ecclesia today: join our mailing list or request monthly schedules online; come to concerts and Festival events; attend one of our services at Holy Rosary; and share our story with friends and neighbors. If you are in a position to help financially, consider a one-time donation to the choir or a monthly commitment of support. Many employers have matching funds available for qualifying nonprofit corporations; ask your employer today if yours has such a program. All gifts are tax deductible, with our Federal Tax I.D. number of # 41-2042868. We need your help to continue over three decades of the very best in sacred music and liturgy. With that support comes our promise that every contribution is spent carefully and wisely, and deeply appreciated. © 2017 Cantores in Ecclesia. All Rights Reserved.